"Creative reconstruction" is underway in the aftermath of the Great East Japan Earthquake of March 11. 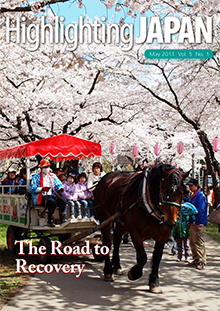 The activities of the Kamaishi Seawaves rugby team after the tsunami which devastated their town have captured the imagination of people around the world. Introducing the activities of three very different companies in the immediate aftermath of the Great East Japan Earthquake. Three foreign journalists give an account of their personal experiences on and after March 11. Ueno Zoo has welcomed two new giant pandas to its enclosures in Tokyo. Less than two months after the earthquake and tsunami of March 11, the Tohoku Shinkansen line fully reopened. An interview with Ambassador of the Federal Republic of Germany in Japan Dr. Volker Stanzel. A little over a month after the earthquake and tsunami which devastated coastal areas of Iwate Prefecture, Tenshochi park in Kitakami once again drew in thousands of visitors as its famous cherry trees burst into bloom. Consumers in Tokyo have been rushing to buy goods produced in the areas hardest hit by the March 11 disaster. Highlights of a roundtable discussion between leading diplomats from Japan, China and the Republic of Korea. Professor Takao Komine comments on the likely course of the Japanese economy in the short and medium terms. The Japanese government has released a roadmap for actions for recovery following the accident at the Fukushima Daiichi Nuclear Power Plant. The actions of children around the world have given courage to victims of the Great East Japan Earthquake.